Do you think the narcissist isn’t using you? Think again! As I’ve mentioned before, and other times, the narcissist wants your friends. 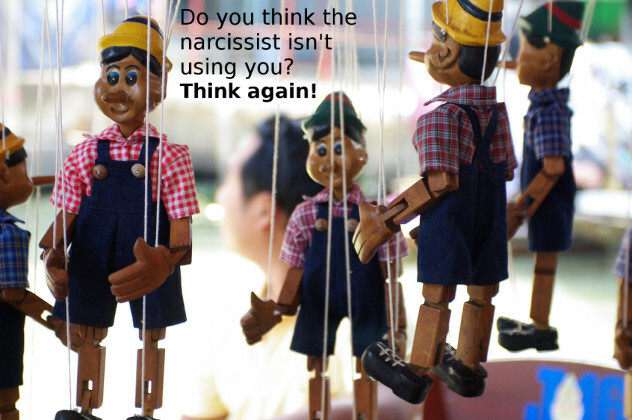 Narcissists want to make sure that no one believes you about the abuse, they want to make sure that you don’t have a support system, they want to “win” the break-up, and they want to hurt you. Plus, if they can charm over your closest friends, then they have an all access pass to your secrets that you told your now former friends in confidence. My ex narcopath has worked hard to win over anyone and everyone, but he especially focused on the people I had trusted and talked to the most. He did it over a period of several years. Eventually, even “friends” who swore they would never ever be won over by him, back-stabbed me and dumped me to be his friend instead. People who knew how cruel he was! How did he do it? Well, I watched him do it, and I tried really hard to tell those now former friends as I saw it happening online! First, he would reply to one of my friends in an online forum–just very casually. He’d make sure they saw him being normal and non-abusive. Then, he might try it again, replying to them more directly. Soon, he’d include them in jokes. He’d send a little message to someone just to be “helpful.” He’d join in fun posts with them. He’d start having longer conversations. He’d send a friend request. He’d chit-chat casually from time-to-time. Then, the conversations would get longer. All this time, he’d be putting on a wonderful show of being very normal, fun, helpful and funny. Not a hint of the true craziness underneath! For a long time, he’d continue this grooming process. I’d tell my friends what he was doing and they’d tell me it was no big deal, he wasn’t going to win them over. He wasn’t doing anything…. WRONG. He was playing a careful game. The goal was to look very normal, and to start pushing his way into their worlds while looking like a nice guy. Slowly, my friends would start to think he was not so bad, that he was safe after all, that he was a good guy. Slowly, they’d start to think I was exaggerating about the abuse, that I was overreacting, that I was lying. By the time narcopath had finished, my friends were firmly in the palm of his hand. Some were so convinced that they began attacking me publicly on his behalf. The transformation was complete. Most of these people swore that it wouldn’t hurt to chit-chat with him, but they underestimated what I know well–his goal was to manipulate them and win them over. Only a few people saw through him when he tried to cozy up to them. Most people thought it was no big deal and didn’t realize that they were slowly groomed, brain-washed and manipulated–even after they were warned!